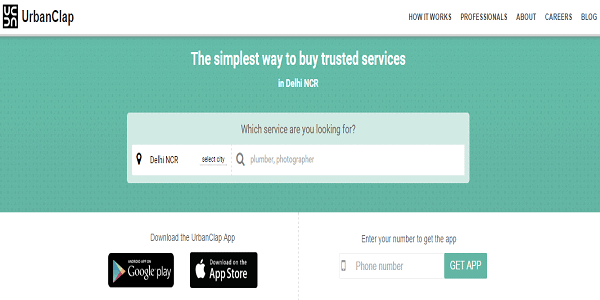 How UrbanClap became India’s largest mobile-based services marketplace? UrbanClap is an online platform for customers to scout for the best professionals in the service industry- be it architects, wedding photographers, yoga teachers, educational counselors or lawyers. Simply put, it connects online users with offline businesses. Their vision is to use technology and smart processes to structure the highly unorganized services market in India and emerging markets. UrbanClap aspires to make hiring a service professional as easy and straightforward as ecommerce companies have made buying products. UrbanClap was founded in October 2014 by the trio Abhiraj Bhal (IIM Ahmedabad, IIT Kanpur, Boston Consultancy Group), Varun Khaitan (IIT Kanpur, Boston Consultancy Group) and Raghav Chandra (early Twitter engineer, University of California, Berkeley). UrbanClap offers 50+ hiring services across 5 major categories – Home, Health, Events, Lessons and other personal services. [su_box title=”More startup of the week choosen by DSIM:-” box_color=”#c7c7c7″ title_color=”#000000″ radius=”5″] 1)How Flexiguru is solving the needs of students by combining content with videos and making it their USP? Technological upgradation and mobile communication advancement have paved way for further improvement in the field. Taking a cue from IT, three IITians Varun Khaitan, Abhiraj Bhal, and Raghav Chandra dreamt together to make it big in their respective field and weaved together their dream ‘UrbanClap’. UrbanClap is a platform to make urban lives more fulfilling to solve needs in a clap. Hence the name is, UrbanClap. The venture was born out of their passion to solve a large-scale consumer problem in India- one that could be solved using mobile internet. Amused with the idea, they worked on its marketing nuances and to their surprise they discovered that it can bring changes to existing trend and they changes the rules of game and steered it in their own way. An early inspiration behind this idea clicked in adulthood and today is one of the largest mobile services marketplaces across India. Why we choose UrbanClap as Startup of the Week? • UrbanClap is helping consumers locate multiple professional services for fitness, beauty, coaching classes, etc. • The services are mostly provided at the residence, office or chosen venue of the consumer. • Its core team of 25 members is doubling every month. • It has over 10,000 customers on their platforms and connections worth 5crores of business value. • Service is available on android app as well as through website. • The market size for UrbanClap is growing 20-30% a year. • UrbanClap reaches approx. 12,487 daily unique visitors and that generate 81,165 daily page views. • A daily Ads revenue reaches $39, 56 approximately and monthly Ads revenue $1.168, 06. • UrbanClap.com has estimated worth of $ 50,269 and has a daily income of around $ 31. • UrbanClap has 97000+ likes on Facebook and still counting. UrbanClap works on two simple models: For standardized, blue collared services like electricians or home cleaning, where you just want the job done, you can directly book and pay for the service on their app. For white collared services, which are the larger part of the business, like photographers, interior designers or yoga instructors, UrbanClap makes the effort to understand exactly what you need, and helps you hire the right professional, in your budget, most suited to meet that need. This is done through an automated match-making algorithm, which the team is investing heavily to continue perfecting. UrbanClap also does a background check and police verification for all its professionals. For this purpose, they have hired a retired superintendent of police. UrbanClap had raised $1.6 million angel round of funding from SAIF Partners, Accel Partners, and Snapdeal founders Kunal Bahl and Rohit Bansal. Earlier UrbanClap has had raised $ 10 million in its Series A round of funding from its existing investors SAIF Partners and Accel Partners. UrbanClap currently has services in Delhi-NCR, Bangalore, Chennai and Mumbai, UrbanClap plans to expand Tier I cities first and then small towns. In addition, the company will look to expand its category offerings. UrbanClap aimed to connect their users to the best professionals suitable to address their problems at reasonable pricing. 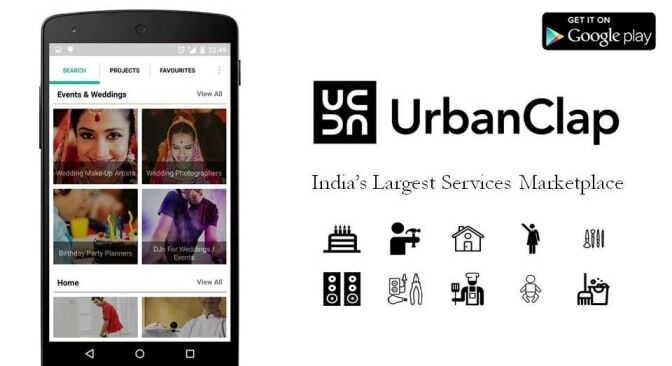 With more than 1,000 service providers currently listed, including individuals and companies, UrbanClap claims to be the largest mobile-based services marketplace in India. The Company is now heavily focused on 10 categories and this can increase to 40.